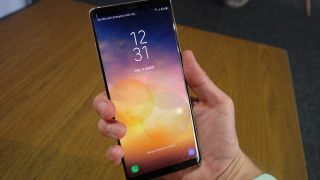 There's plenty of tech news for you to get your teeth into today: upcoming hardware from Apple and Samsung, a new benchmark in the rise of artificial intelligence, and a change in Google Maps that you might not have noticed, all courtesy of our friends at TechRadar. We're expecting the Galaxy Note 9 to break cover on the 9th of August, which is this Thursday, but Samsung isn't going to have many surprises to share. The latest leak in a long line of leaks shows a Russian retail package for the phone, listing all of the specs down the back – they range from a 6.4-inch screen to a 12MP+12MP dual-lens camera. Carrying on the theme of leaked images of upcoming handsets, a blurry photo making the rounds on the web is said to be of the 6.1-inch LCD iPhone 9 – the cheapest of three iPhones Apple is rumoured to be launching next month. Based on this picture, the phone will stick with a single-lens rear camera, though it seems to have a bigger sensor on board. We're also expecting some new iPad Pros before the year is out, and code hidden in the beta version of iOS 12 suggests they're going to borrow one of the style tweaks of the iPhone X – specifically, rounded corners on the display. That would also point to the bezels being shrunk, to follow the style of Apple's phones – so no more Home button or Touch ID. Artificial intelligence continues to improve at a rapid rate, and a system called OpenAI Five has emerged triumphant from a series of games against the best Dota 2 players in the world. AI beating humans at games is nothing new of course, but the complexity of Dota 2, with multiple characters and playing strategies, means this is a big step forward for AI. Here's a small but maybe significant change in Google Maps: if you zoom all the way out of the planet, you no longer see a flat map but rather a curved globe, just as you would if you were shot into space. This means the size of countries can be more accurately represented, and the change is coming to the web first before a roll out on Google Maps for mobile.